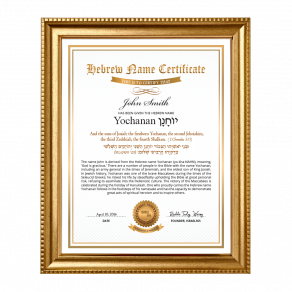 A digital Hebrew Name Certificate will be Emailed to you for free with the purchase of a Hebrew Name Plaque. Names are of utmost importance in the Jewish tradition. Find out your Hebrew name and its Biblical significance and receive your own personalized certificate. 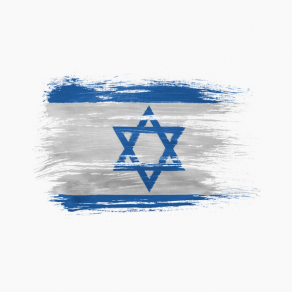 Personally prepared for you or your loved one by the staff at The Israel365 Store, our Hebrew name certificates are a unique and personal gift. Our researches delve into the meaning of one’s given name, and then match it to a Hebrew name. The connection is based on equivalent meaning or Biblical character who personified the meaning of the individual’s name, or based on similar phonetics. 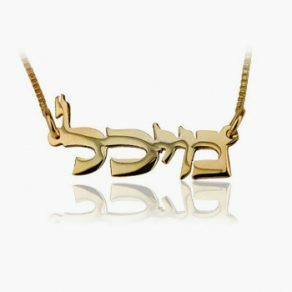 Our name certificates include the Hebrew and English spelling of your Hebrew name (and its pronunciation), the Biblical significance of the Hebrew name and a biblical verse. The plaques are available in your choice of either gold or silver metal mounted on polished wood. The plaques can be hung on a wall or stood up on a surface. This verse describes God's interest in every star by giving them names. By extension, God has great interest and involvement with each and every one of us, whom He also relates to, through our given name. According to Jewish tradition, one's name has a deep spiritual dimension, as the chosen name determines a person's character throughout life. We will personally research and prepare a special Hebrew Name Certificate for you to better understand the biblical origins of your name. Hello. I would like to know if there is a hebrew name for Coralie please. Thank you. 1. How do you derive the Hebrew Name? 2. Is shipping free? I live in Singapore. PLEASE CAN YOU TELL ME WHAT MY HEBREW NAME IS? MY NAME IS JOAN MARIE GENTRY? I WILL BE GLAD TO PAY FOR IT. I AM OUT OF THE HOUSE OF DAVID!!! We sell a few different Hebrew Name products. You can find them at the following link: https://www.israel365.com/store/product-category/my-hebrew-name/ ( https://www.israel365.com/store/product-category/my-hebrew-name/ ). Shalom and thank you for your questions. In general, we research the meaning behind a given first name and then the corresponding Biblical name. Many names (in a variety of language) are in fact derived directly from names found in the Bible. Very poor. I don’t think knowing the Hebrew for my name Lawrence is worth $99. Could you please tell me what the name “Julie Thiesen” is in Hebrew. Shalom, We sell a few different Hebrew Name products. You can find them at the following link: https://www.israel365.com/store/product-category/my-hebrew-name/ Please let us know if we may be of further assistance. Thank you. Shalom, We sell a few different Hebrew Name products. You can find them at the following link: https://www.israel365.com/store/product-category/my-hebrew-name/. Please let us know if we may be of further assistance. Thank you. This is one of the most Beautiful plaques I have. I think everyone should have one of these. Who ever thought of this idea is a genius! And secrets of the future Temple is a fantastic book too. I absolutely love Israel 365! Would make such a thoughtful gift to give or receive. I want to know the meaning of Mahlah, can anyone tell me? How do you write Sandra in Hebrew?